- Joyfully express Christs love and grace through service to one another and our community. Every year many campers take part in our four weeks of camp. We also have numerous other retreats and events throughout the year for all ages, such as Youth, Ladies and Family Camps. 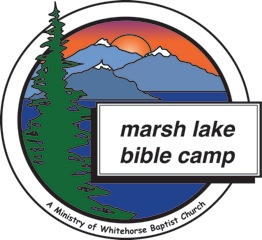 Marsh Lake Bible Camp is a volunteer Christian camp owned by Whitehorse Baptist Church, situated on 6.2 acres of lake front property. The camp is located on the shores of Marsh Lake approximately 50km from Whitehorse, Yukon, Canada.